Would you fall on a grenade to save your friends? How about two grenades? 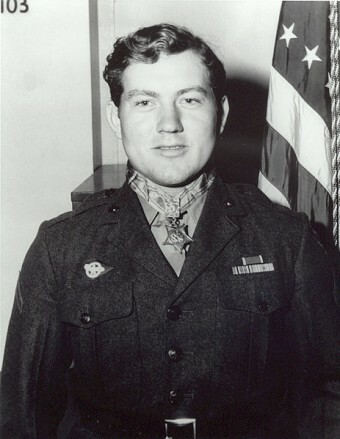 Jack H. Lucas did and became the youngest man to be awarded the U.S. Medal of Honor, the United States’ highest combat award. Born Jacklyn Harrell Lucas in Plymouth, NC on February 14, 1928, Jacklyn was a natural athlete who quickly rose to captain of the football team at his high school, the Edwards Military Institute. By the age of 14, Jack looked much older. Relatively tall for his age (5′ 8″) and brawny at 180 pounds, Jack had no trouble convincing the Marine Corps recruiters that he was 17 when he enlisted in August of 1942. Notably, to enlist at age 17 (as opposed to 18), Jack needed a parent signature – so he forged his mother’s. Jack did his basic training at Parris Island, South Carolina and qualified as both a rifle sharpshooter and a heavy machine gun crewman. In November 1943, he was assigned to the 6th Base Depot of the V Amphibious Corps at Camp Catlin in Oahu, Hawaii. There he achieved the rank of Private First Class in January of 1944. However, after reviewing a letter Jack had written to his girlfriend, military censors realized he was only 15 years old. He was then removed from his combat unit, but rather than sent home (something he argued heavily against), he was assigned to truck driving. Of course, being “in the rear with the gear” was not Jack’s idea of military service. Angry, he got into so many fights that he was ultimately court-martialed and spent 5 months breaking rocks and consuming mostly bread and water. Released from the stockade by January 1945 and still determined to see combat, Jack walked away from his post that month and stowed away on the USS Deuel, a transport ship heading toward fighting in the Pacific. Because he left his assignment, he was declared a deserter and reduced in rank to Private. Now closer to the action, after hiding for about a month, Jack finally turned himself in on February 8, 1945, once again volunteering to fight. On February 14, he turned 17. By February 20, he got his wish and was fighting on the island of Iwa Jima. During the battle on February 20, 1945, Jack and his comrades were advancing toward a Japanese airstrip near Mount Suribachi. Taking cover in a trench under heavy fire, Jack realized they were only feet away from enemy soldiers in a neighboring trench. He managed to shoot two of the soldiers before two live grenades landed in his trench. Thinking quickly, Jack threw himself on the first grenade, shoving it into volcanic ash and used his body and rifle to shield the others with him from the pending blast. When another grenade appeared directly after the first, he reached out and pulled it under himself as well. His body took the brunt of the blasts and the massive amount of shrapnel. His companions were all saved, but his injuries were so serious they thought he had died. Only after a second company moved through did anyone realize he was somehow still alive. Jack endured nearly two dozen surgeries and extensive therapy and convalescence. Despite the surgeries, over 200 pieces of shrapnel remained in his body for the rest of his life. Shortly after his act of heroism, on February 26, 1945, the deserter classification was removed and he was restored to the rank of Private First Class. Ultimately all 17 of his military convictions were also cleared. Nonetheless, he was unfit for duty and discharged form the Marines on September 18, 1945. On October 5, 1945 President Harry S Truman awarded Jack, and 13 other recipients at that ceremony, the Medal of Honor. Notably, however, at 17 he was the youngest there and the youngest to ever receive the award. For his bravery and service, Jack also received the Presidential Unit Citation, American Campaign Medal, Asiatic-Pacific Campaign Medal, the World War II Victory Medal and a Purple Heart. So what happened after? Besides graduating high school and earning a business degree, at the age of 31, he enlisted as a First Lieutenant in the 82nd Airborne Division of the U.S. Army. During his first training jump, according to his team leader, “Jack was the last one out of the plane and the first one on the ground.” You see, neither of his parachutes opened. Despite this and an approximately 3,500 foot fall, he miraculously survived with only minor injuries. Two weeks later, he was back jumping out of planes. Once he returned to civilian life four years later, he opened a chain of beef selling businesses in Washington, D.C., married a few times (including one wife who tried to have him killed), and later, with the help of D.K. Drum, published an autobiography aptly titled, Indestructible. Jack lived to the ripe old age of 80, dying on June 5, 2008 from leukemia. A more recent individual who jumped on a grenade to save another soldier was Lance Corporal William Kyle Carpenter. On November 21, 2010 while in Afghanistan, a grenade was thrown into his sandbagged position. Rather than run, he used his own body to shield the other soldier with him from the blast. Like Jack Lucas, though severely injured, Carpenter lived and was awarded the Medal of Honor in June of 2014. During World War II, U.S. armed forces used the Mk 2 hand grenade (Mk II), a fragmentation type of grenade. Resembling a type of fruit, it was given the nickname “iron pineapple.” The time from pulling the pin to explosion of a time-delay fragmentation grenade can vary from between 2 and 6 seconds. Four-hundred and sixty-four service members were awarded the Medal of Honor in World War II, including 82 Marines. To date, 15 service members have been granted that honor from the wars in Iraq and Afghanistan combined. In total, 3,468 Medals of Honor have been awarded, with the most (1,522) being given for service during the American Civil War. In addition, 193 have been to non-combat recipients. The most recent recipient (awarded on July 21, 2014) was Sergeant Ryan M. Pitts of the U.S. Army, 2nd Battalion, 503rd Infantry who, on July 13, 2008 in Kunar Province, Afghanistan, despite severe wounds, launched fragmentary grenades, laid suppressive fire, and risked his life to convey vital situation reports, which helped prevent the enemy from gaining a strategic foothold. By February 20, he got his wish and was fighting on the island of Iowa Jima. I believe that should be Iwo. @Kabal: You mean you’ve never heard of the great WWII battle that took place in Iowa? 😉 Thanks for catching that, fixed! I believe he fought in Iwo Jima, not “Iowa” Jima. My apologies to Kabal; I didn’t see your similar comment before I posted mine. Very nice article, it’s remarkable how resilient the human body can be at times. Note that you may be thinking of William Kyle Carpenter (http://en.wikipedia.org/wiki/Kyle_Carpenter) rather than William Kyle Kennedy in your bonus fact. This same mistake occurred in a recently posted collection of quick facts on this site. It made it a bit difficult to find additional information about the heroic acts of that individual. Also, Daven, I love your site! I particularly enjoy the long-form articles as they help pass the time while I drink my morning coffee or have lunch. Quick facts and info graphics have their place as well, but they aren’t nearly as absorbing as a nice article.